EQUIP PM: Supporting increased community tenure for the super-utilizers of behavioral health inpatient. Based on research and policy changes in New York State, CCNY, Inc. was aware that the so called super-utilizers would be a small, but costly, percentage of the Medicaid population. Also, we wanted to investigate whether Behavioural Health and co-morbid individuals, would be the highest of the high risk/cost individuals, which after our analysis, turned out to be true. If managed care organizations, local government agencies, and network service providers couldn't identify these individuals, and know how to impact their care trajectory, they would struggle financially, and provide high touch services to those that require a less intensive intervention. This tool focuses on finding those individuals who are at high risk of Behavioral Health inpatient and notify care providers, and administrators before they readmit, and provide care guidelines that will turn the curve on this individual's trajectory. The algorithm is based on the behavior of the individual that impacts their risk. For example, some super-utilizers are behaving in a way that will mitigate their risk. Some examples are if the person is taking their medication regularly, or filling their prescriptions in a timely manner. There are other factors in the algorithm that are accounted for based on the individual's behavior. Other methods that do not take the individual's behavior into account - i.e population based methods of identifying clients as high risk - will cause case managers, providers, and administrator to focus on on providing high cost services to individuals who are currently managing themselves very well, thus increasing their community tenure. In order to help them identify who to focus on, we have a landing page that allows them to find those who are not only high risk, but also having their community tenure impacted by their behavior. 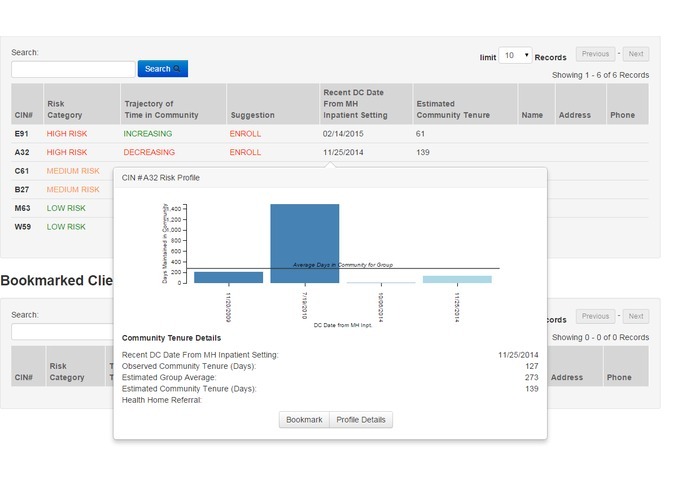 Once an individual is identified, their detail page can be reviewed, which details the behaviors that are impacting their community tenure, what planning suggestions would turn the curve on their work, and a comparison of this individual's behavior to those in the same risk cohort. The primary users of this system would be care management organizations, networks of care, providers, payers, and direct care workers. What key features we are most proud of? We are very proud that the predictive model is focused on increasing an individual's community tenure rather than focusing on risk and cost. 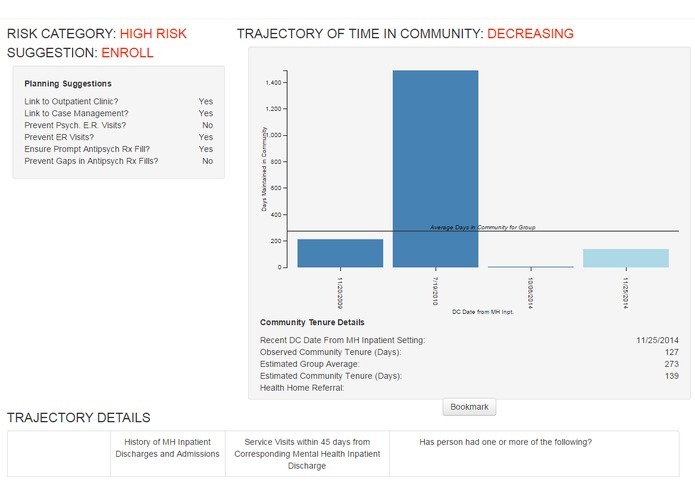 The goal of using this tool is to increase an individual's time they maintain themselves in the community by identifying those who are likely to readmit to behavioral health inpatient, and providing guidelines for the care provider in intervening in their prior to their readmission - thus maintaining them in the community, which is their natural, health, and normative environment.